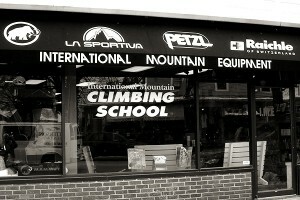 International Mountain Equipment, Inc. (IME) was founded in 1974 by Frank Simon, Bill Aughton and Paul Ross. In August 1979 Rick Wilcox purchased IME from its founders. The International Mountain Climbing School is now co-owned by Brad White and Rick. Brad White is a long time climber and guide from the Mount Washington Valley and now runs the school as head guide and director. Here at IMCS we pride ourselves on our staff. For the last 30 years we have combined our efforts to provide safe, enjoyable and worthwhile experiences to everyone that climbs with us. No matter your age or ability we look forward to sharing the excitement of climbing with you and helping you learn valuable skills along the way. IMCS guides have accumulated many years of climbing, guiding and teaching experience. We are a mix of AMGA certified guides, world class climbers, dedicated teachers and backcountry masters. From indoor wall climbing programs for young children to international climbing expeditions in the great ranges of the world we have guides that can take you there.